This Cheap Photo Frame Is One Out of Hundreds Displays Available Online. Check Out Our Huge Online Catalog. Buy More Cheap Photo Frame and Get More Savings! 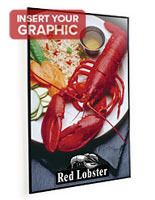 Cheap Photo Frame Holds 24" x 36"
This lightweight printing holder, cheap photo frame is included in our line of affordable plastic framing models. 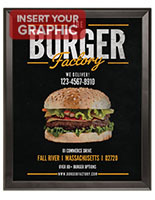 The always popular black color applies to any styles of graphics from kids drawings to complex ornamental artworks. 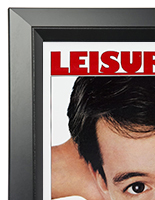 This cheap photo frame is widely used in public libraries, real estate offices and college dorms for displaying announcements, floor plans and idol portraits. This cheap photo frame has 3 components: a thick black foam-board, a non-glare, water-resistant PVC cover and the 7/8" thick black molding. There will be 4 hanging brackets included for user to mount the poster holders vertically or horizontally. And 20 retaining clips help you to hold drawings tightly and in the right position. 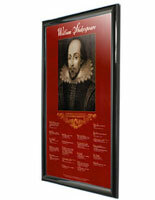 Please Note : This 24" x 36" poster display, cheap photo frame may not be appropriate for displaying upscale applications. 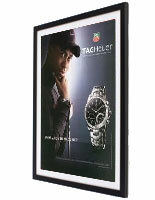 We suggest you to glance over our entire picture frame category before placing order. Also, the provided PVC lens is made from flexible plastic. This is not a glass lens. 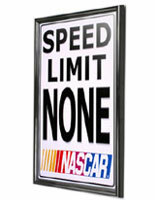 26.0" x 38.0" x 0.875"